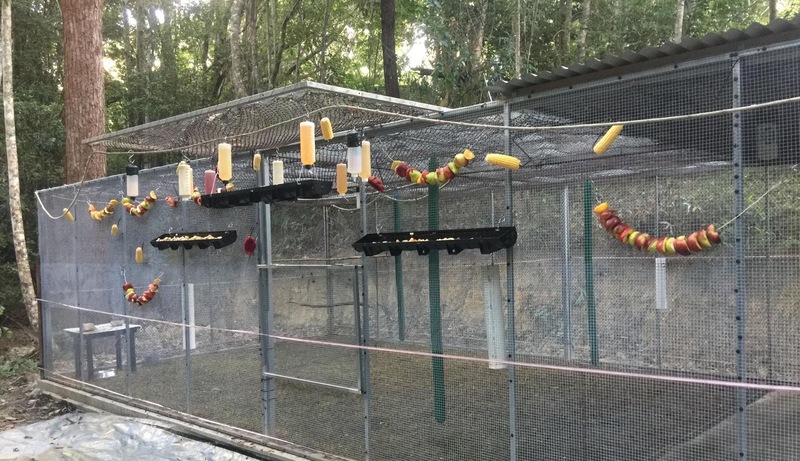 This article by Rebecca Koller, Cairns Wildlife Carer and Flying Fox Advisory Committee member , first appeared in the August 2018 issue of Ecotone, the newsletter of the Cairns & Far North Environment Centre (CAFNEC). Here she discusses an imaginative plan, supported by the local council, to gently encourage urban flying foxes to adopt a safer habitat. The text and photos are reproduced by kind permission of the author and CAFNEC. With construction set to increase in Cairns adjacent to the CBD colony, how do we protect the flying-foxes when all attempts to control development and protect their urban habitat are to no avail? As the wildlife advisor on the Flying Fox Advisory Committee (FFAC) and also a flying-fox carer, I raised the idea of building a care and release facility for orphaned pups in the Cairns Central Swamp similar to an existing one at Speewah on the Tablelands. The Cairns Central Swamp is an area SFF used to inhabit and is only a short distance from the current camp. The idea came about because we noticed something unusual at Speewah. Wild, adult bats were flying over to the enclosure and roosting above the orphaned babies. They could obviously hear, smell or sense the large group of young. After lengthy discussion with members of the FFAC, the idea was put to the Cairns Regional Council (CRC) who have approved it and agreed to fund the facility at an estimated cost of $50,000. A 10-metre cage will be built in an appropriate area within the swamp. Forest habitat regeneration and support of carers through ongoing training have also been approved. A similar approach was taken in Melbourne some years ago but with some differences. New habitat was created and bats were ‘nudged’ toward it with the colony moving about 7km. The difference with this approach is we are using former known habitat of SFFs and not forcibly moving the creatures but attracting them to the chosen area. The idea is still in the planning stages but the intent is to have it operational by October this year to coincide with the upcoming birthing season. 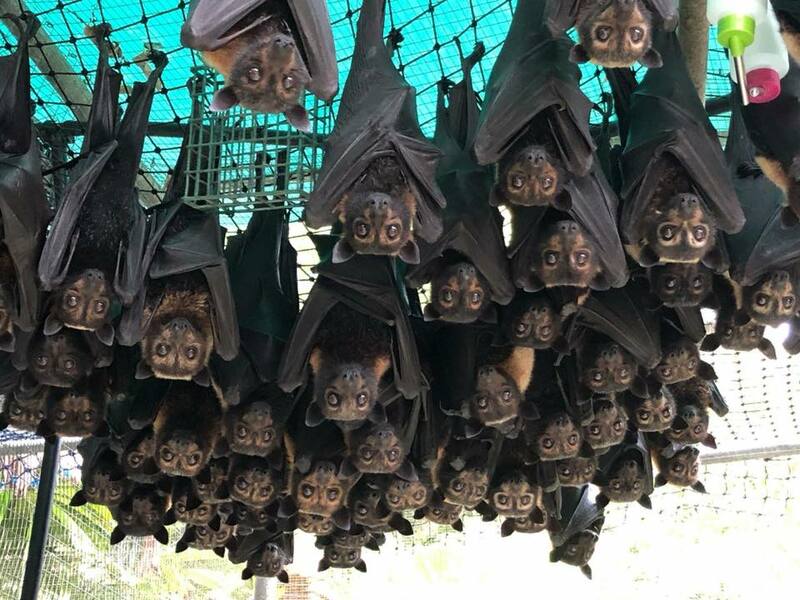 Spectacled Flying-foxes (SFF) in the maternity colony located in the Cairns CBD saw the worst death and abandonment numbers in recorded history during the 2017/18 birthing season with 1154 animals found abandoned, injured or dead between August 2017 and May 2018. This unprecedented increase in numbers was attributed by wildlife carers to a number of factors including habitat loss and development activities. In the past four years, 65% of habitat in the CBD has been removed to make way for developments. Two hotel developments are directly adjacent to the colony on Abbott and Aplin streets and pile-driving activities and huge cranes swing directly over the roost trees right through the birthing season causing enormous stress to the flying foxes. The number of orphans during this season stretched all wildlife carers beyond capacity. We simply had more orphans than was physically possible to care for and had to face the real possibility of needing to euthanase pups. One solution was to send 100 orphans to the Australian Bat Clinic in Brisbane to be cared for and then have them returned for release. This was achieved by our crowd-funding campaign which raised over $17,000. Footnote: from the chair of the Flying-Fox Advisory Committee, Martin Cohen. 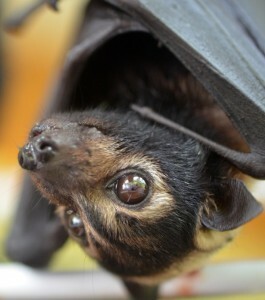 The Cairns Central Swamp site was home to a bat colony until a cyclone swept through in the late 1990s. The habitat’s right and they’ve been there before, so we hope to lure them in. I don’t know if the CBD camp will relocate to the swamp, but it’s worth a go. There’s no downside because the facility will still act as a care and rescue centre for baby bats where carers can rehabilitate injured and orphaned animals to prepare the for release back into the wild. Councils around Australia have tried various methods to disperse flying-foxes, but they’ve had astronomical costs, ongoing effort and limited success. This facility could be a great model for other local governments to use. Just trying to chase or scare them off may be a quick-fix solution but the stress and impact it has on the bats is huge. This softer approach is the way we need to do wildlife management in this day and age. Big increases in the numbers of “Speccies” coming into care are unacceptable and unsustainable.